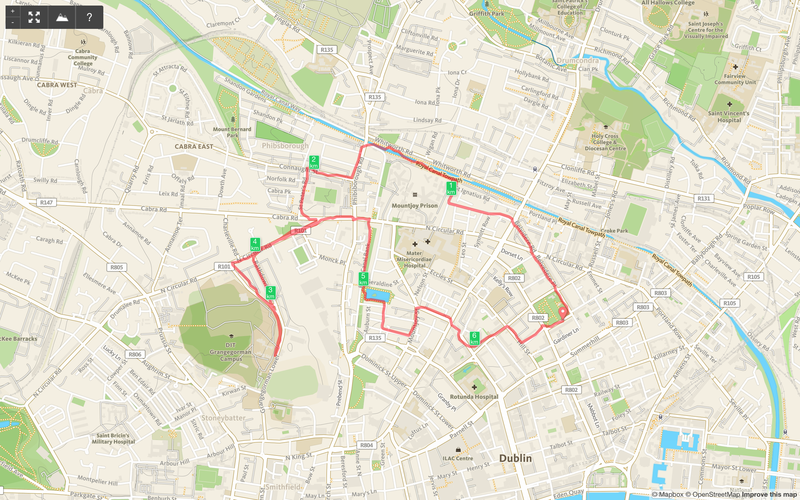 The first James Joyce Half Marathon took place on Bloomsday 2014. 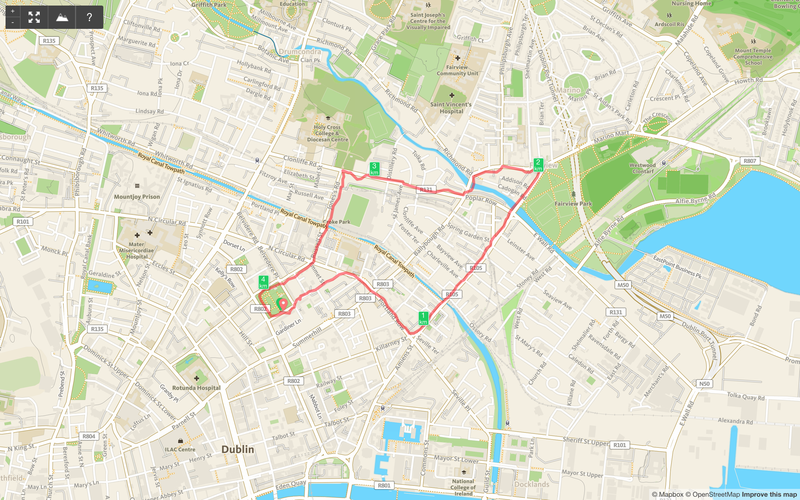 I ran it with Paul Sweeney and Con Kennedy took photographs from a bicycle. 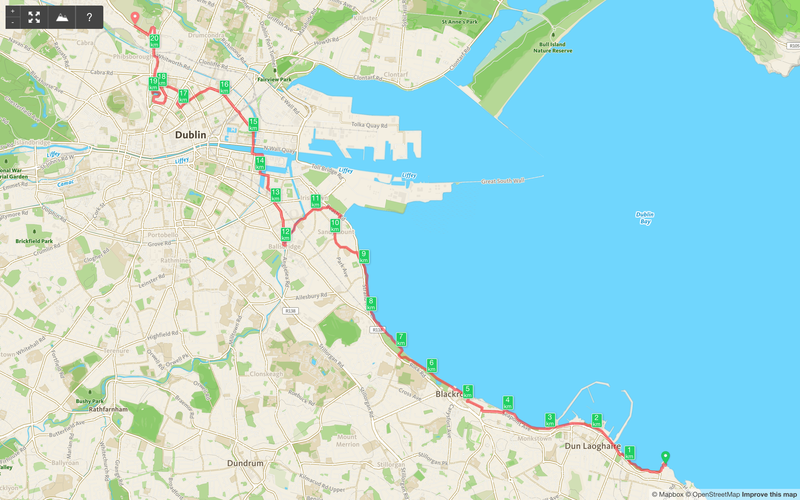 The route was from the Tower in Sandymount to Glasnevin Cemetery. 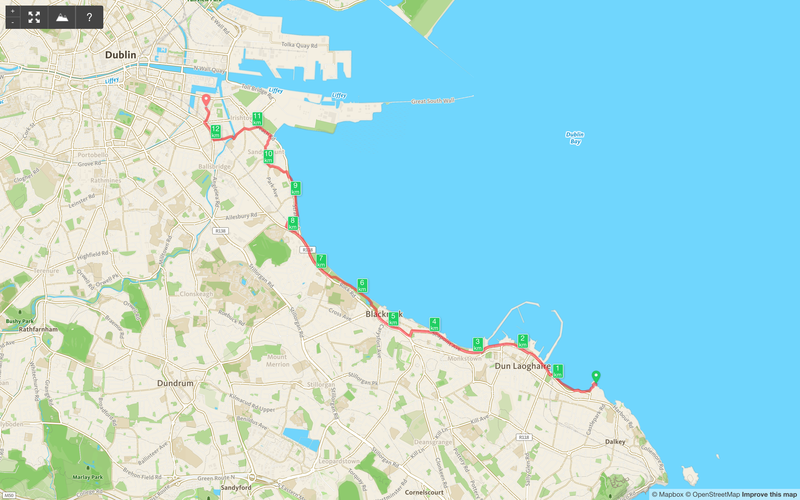 We ran along the seafront to Dun Laoghaire, then on the sea side of the railway line to Monkstown, Blackrock and Blackrock Park, crossed over the Railway at Booterstown to the shoreline and then along the beach to Gilford Road, Dromard Terrace, Leahy’s Terrace, Newbridge Avenue, along the Dodder to Ballsbridge, Shelbourne Road, Barrow Street, Sir John Rogerson’s Quay, Samuel Beckett Bridge, the Five Lamps, Portland Row, North Circular Road, Fitzgibbon Street, Mountjoy Square, past Belvedere College, Hardwicke Street, Temple Street, Eccles Street, Fontenoy Street, through Blessington Basin and the Royal Canal Bank and ended outside Glasnevin Cemetery. You can see the route development maps and runs in the earlier blogpost here. 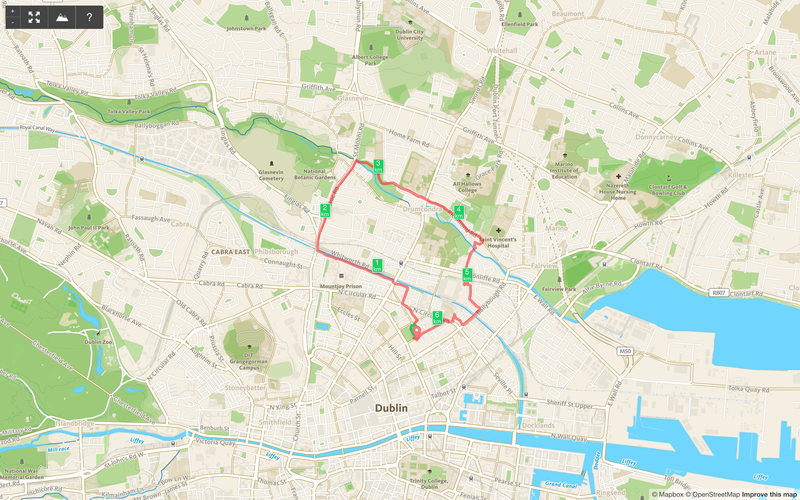 We ran in the evening of a beautiful sunny Bloomsday. You can see Con’s video of the run as a time lapse of the route here, and the hazards of beach running on YouTube here. 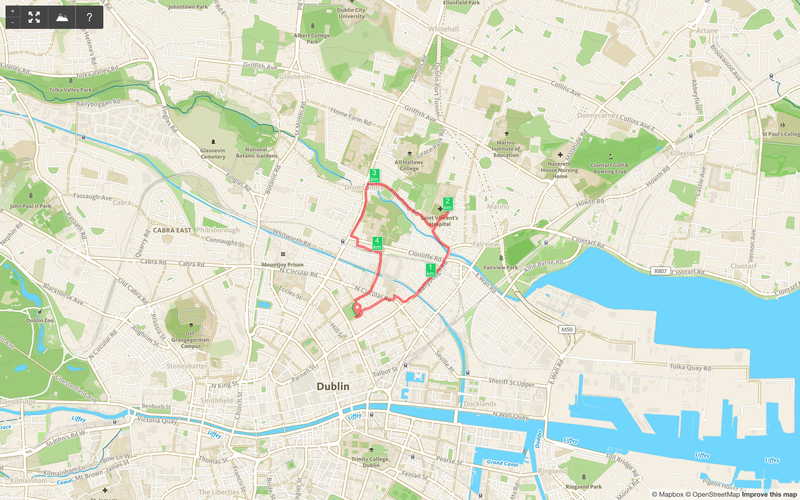 This blogpost documents the early Joyce related runs, prior to the first half marathon, which I ran on 16th June 2014. For some time I had been running around Dublin looking at places that Joyce lived in and wrote about. 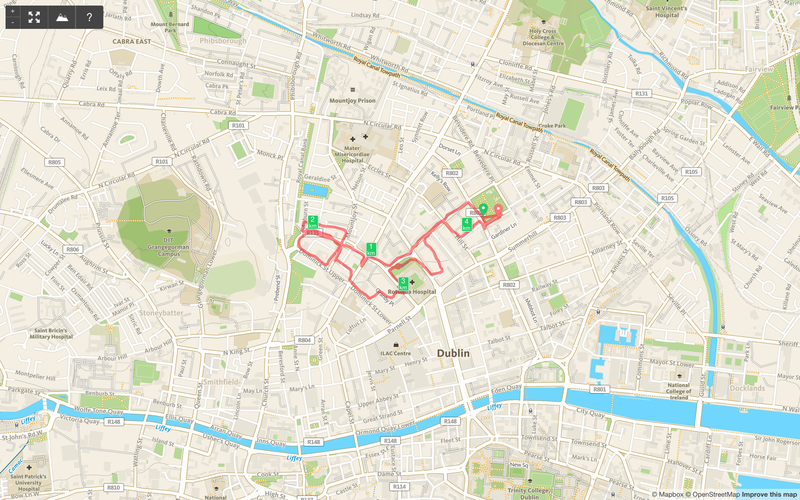 I decided to develop a route that could be developed as a Joyce related running race, something to add some fun to Bloomsday, or any other day in Dublin. 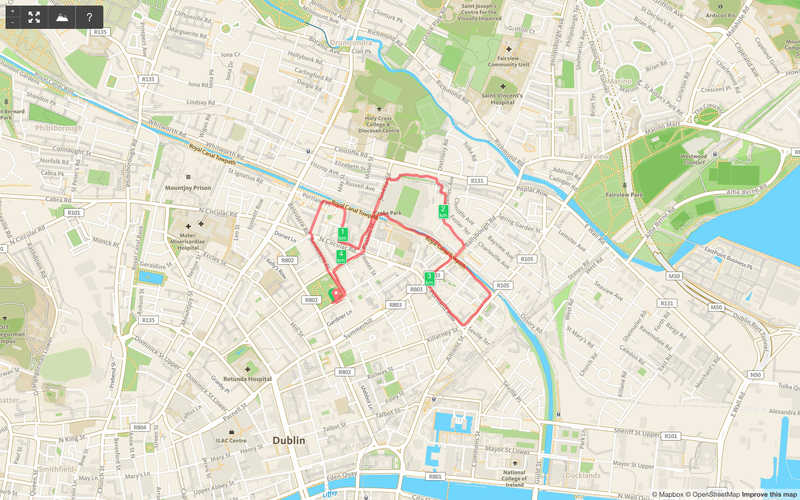 In these early runs I was looking for places that I could use for content in the 21k run. I would read works written by, or about Joyce and set out to see what was in the existing locations and whether it was interesting from an academic point of view and also from a running point of view. My overall aim was to create a visually interesting and challenging run, that was also intellectually stimulating. There were a number of challenges to be worked out. The first one was the overall distance and route. 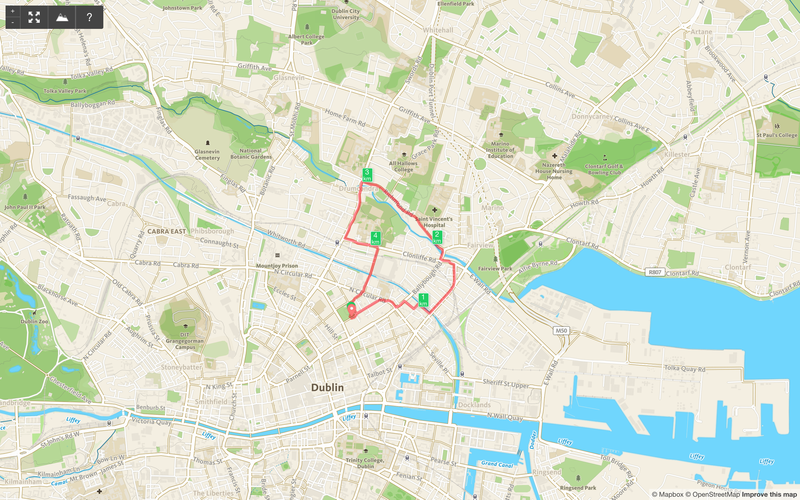 Pretty quickly I decided to run from the Tower in Sandymount to Glasnevin Cemetery. 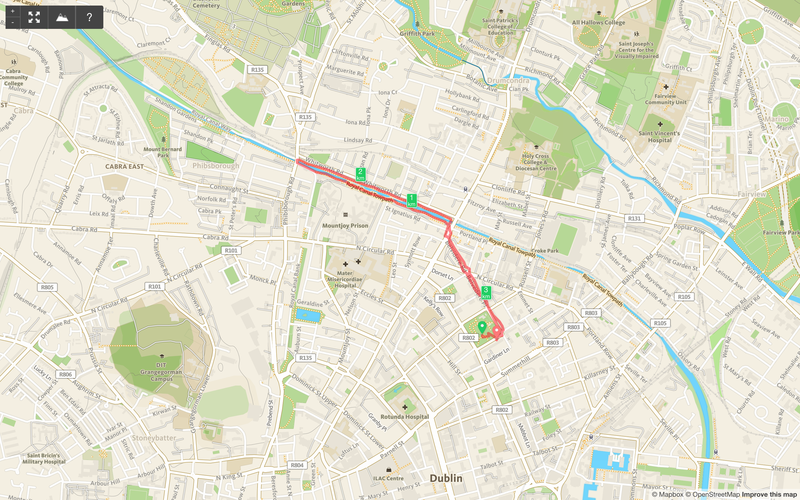 You can see regular pedestrian routes between the two locations on Google Maps here. 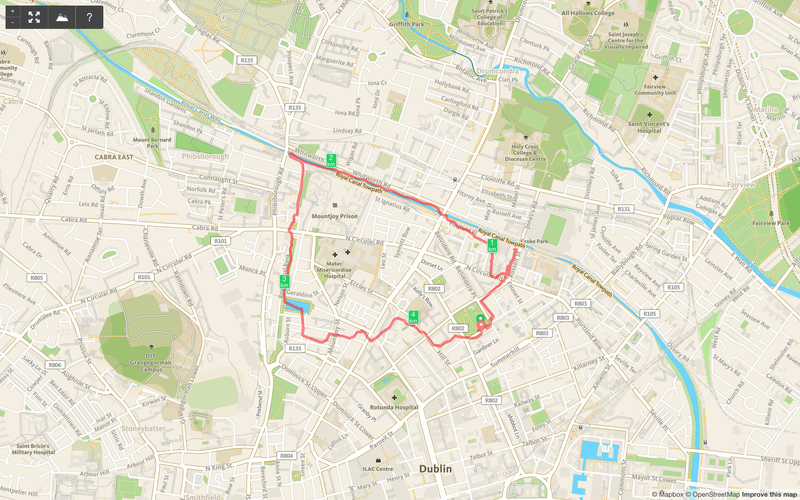 There are a number of relatively direct routes and these were all about 16km. 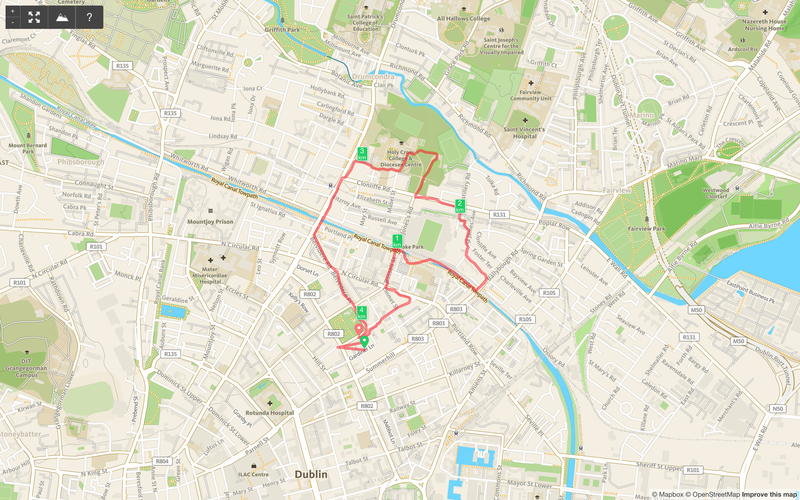 A half marathon is close to 21km, and as I knew I would be making a bespoke route, I settled on this distance. 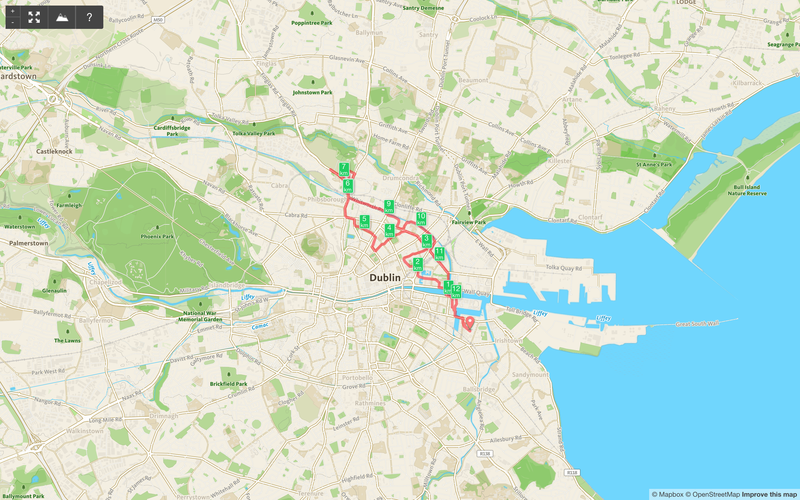 I went on a number of preparatory runs and they are all pictured in screen grabs from Runkeeper, a running app, below. 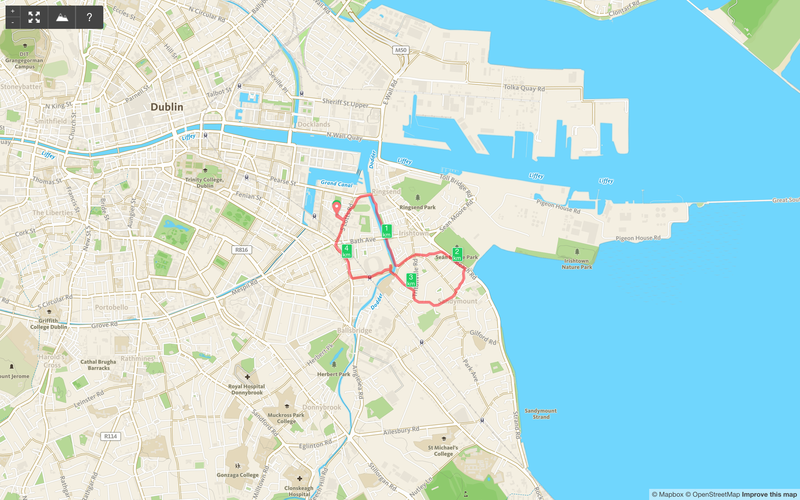 As with all the runs, you can have a look at details on my page and if you click on this link you will open up the Bloomsday run route details. 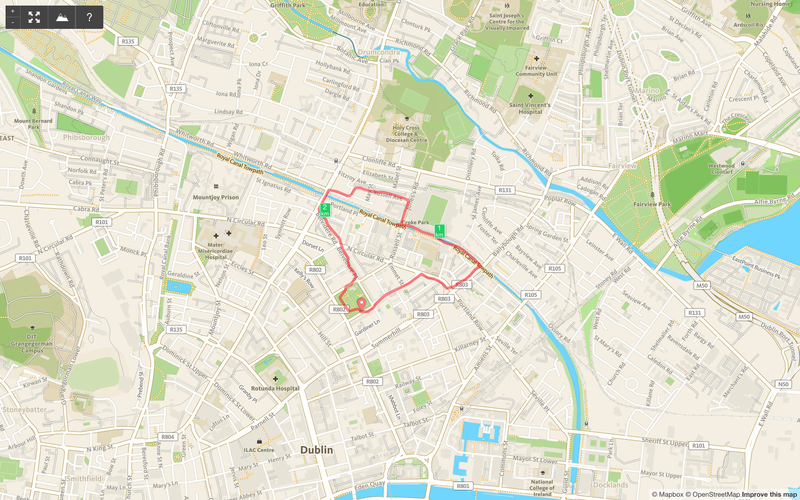 For the preparatory runs I usually ran from work in DIT Mountjoy Square, or from my house in Ringsend. In the case of the runs from Sandycove I took the Dart out to Glasthule and went from there on to the Tower. 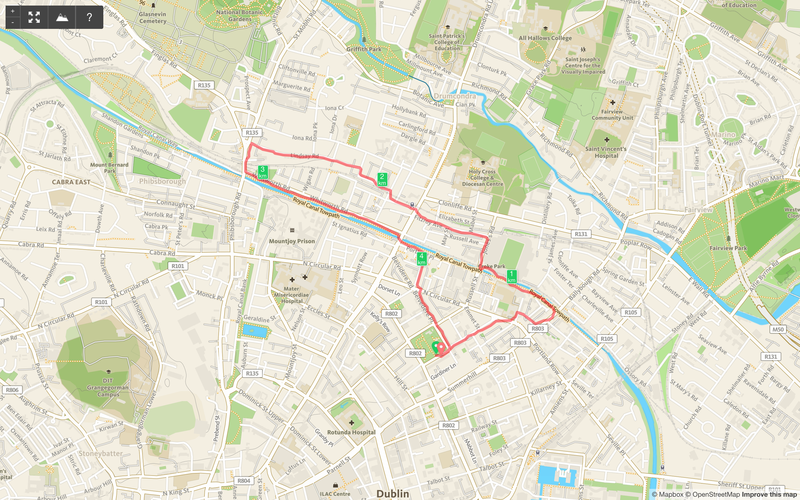 The route from the Joyce Museum into town was relatively straightforward. i decided to hug the coast as much as possible. This meant keeping to the sea side of the Dart line from Sandycove to Monkstown. I used Google Maps to have a close look in advance and then took a number of preparatory runs. Heading north from the Tower I decided to keep to the coast and cross the railway line at the footbridge at Brighton Vale, rather than come off the seafront earlier and run along the road. 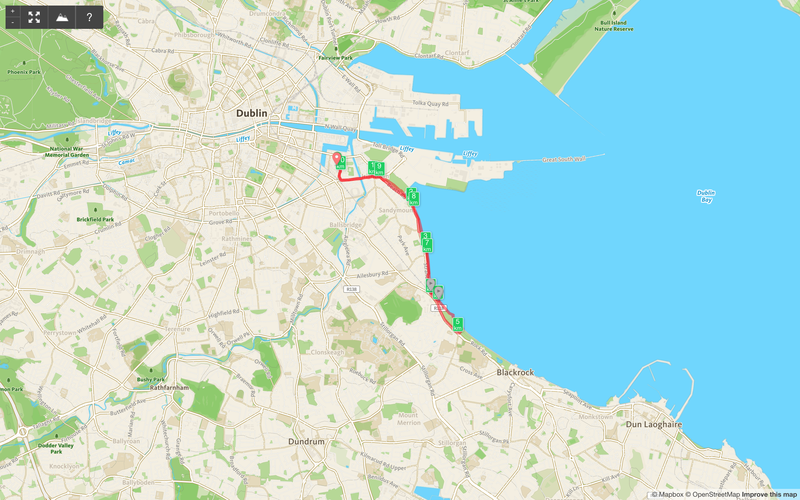 On one early run I went inland at Blackrock and ran along the bypass alongside the bottom of Carysfort Avenue. I was building content into the run and with this route I passed by one of Joyce’s early homes, Leoville. But it was an awful running experience. So I kept as much as possible to the coastline. I had to make many similar decisions in balancing what was a good running experience against a good Joyce related experience. The next difficulty was what to do at the Merrion Gates. If there was train coming what would happen to the race? 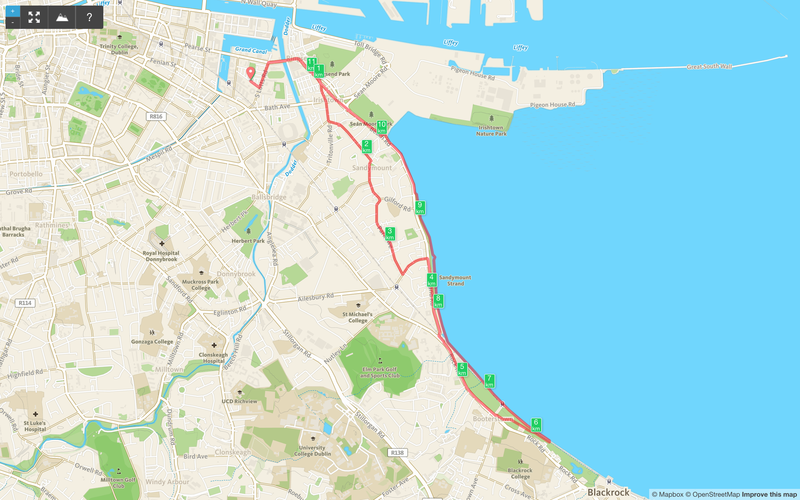 I tried a route that allowed for crossing the railway via the pedestrian footbridge at the back of Our Lady Queen of Peace on the Merrion Road, but again it was an unattractive route once you crossed the railway and made your way back to the seafront. 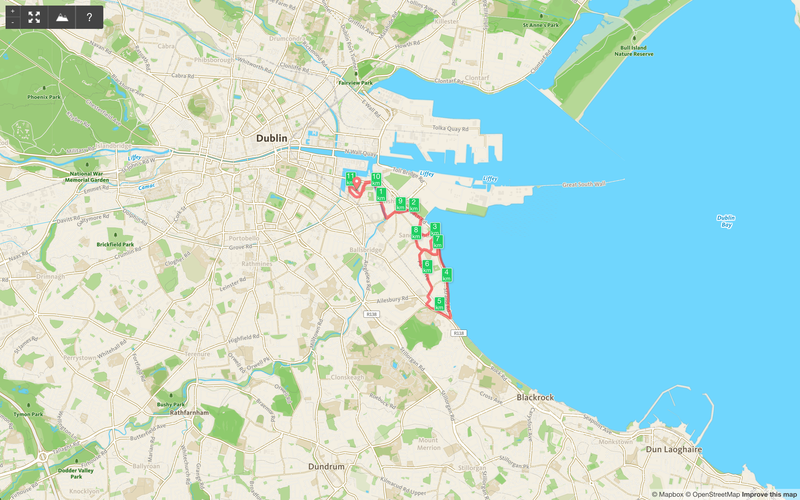 So I tried crossing the railway at the Martello Tower in Booterstown and eventually settled on crossing the railway line at the open footbridge beside Booterstown Dart Station. I tried to keep to places that were mentioned in Joyce’s writings and which had little changed in the intervening years . Running on the seashore felt more authentic. It also meant that I had to ford a small stream on the shore side of the Booterstown Nature Reserve. Again this seemed more fun, but it meant the run would have to be done at low tide. 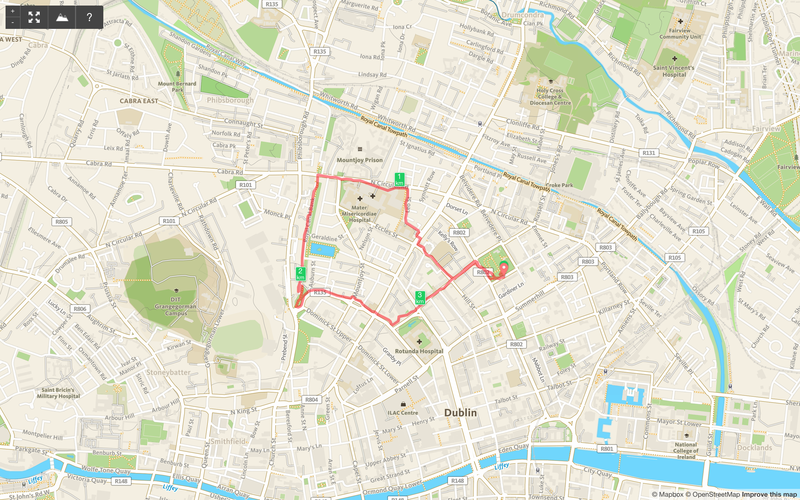 it is hard to run through the City Centre on a quiet day and on Bloomsday it would be very difficult, so I decided to avoid running past places like Davy Byrne’s and instead skirted around the City Centre, keeping to Sir John Rogerson’s Quay and out via Portland Row. This meant crossing the Liffey via the new Samuel Beckett bridge. 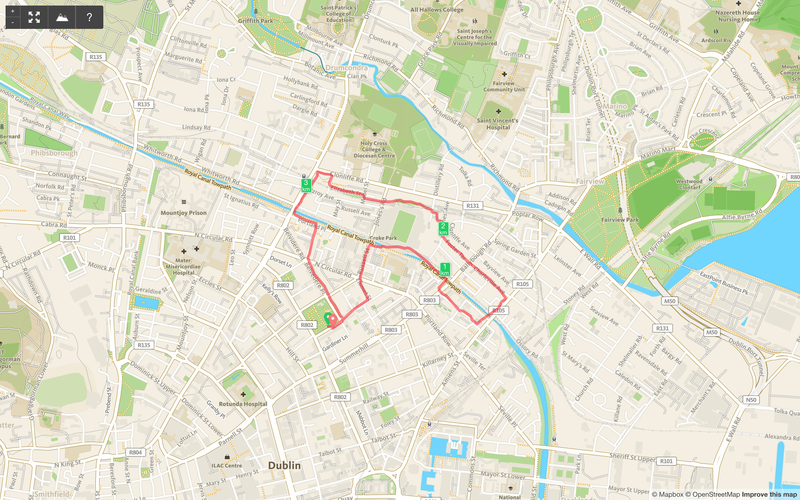 As I was prototyping an actual race route, this seemed sensible, although the Joycean links are tenuous. 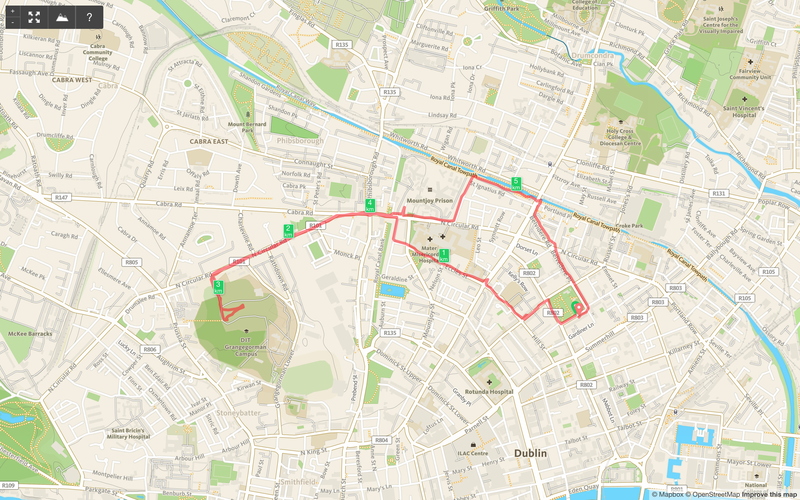 Part of the idea of the race was to have a quiz with relevant questions related to the route, Joyce’s life in Dublin, and his writings. The winner would be someone with a good balance of running and reading skills. Someone who got out more. 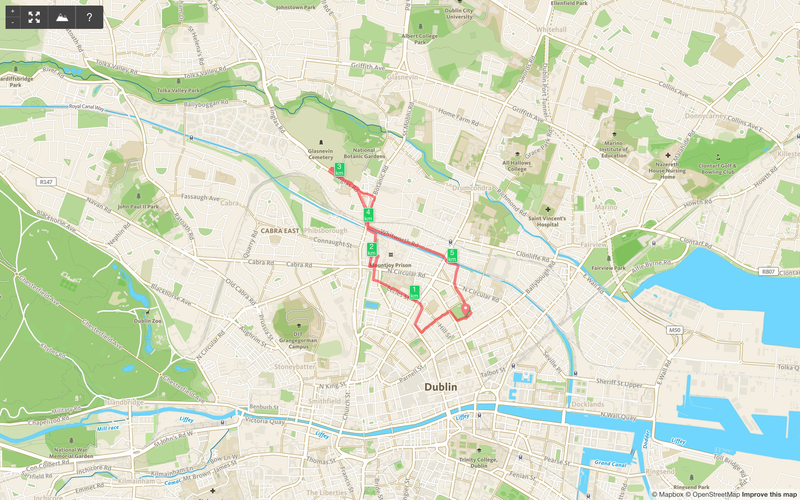 You could go to Glasnevin by just heading up the Canal and if there was a public race it would be the simplest thing to do. As it was I chose a complex northern end and the route snaked around Fitzgibbon Street, Belvedere College, Hardwicke Street, Eccles Street, and my favourite, Fontenoy Street. This was more for cultural content reasons than running ease. I tried multiple different routes and you can see these in the maps of the preparatory routes below. I did consider heading out via Fairview, but it added too much length. 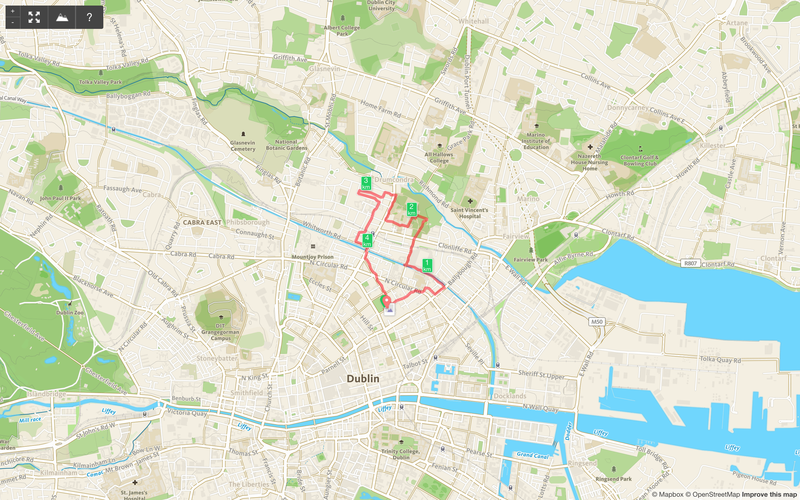 After the race I continued to run the routes, developing different blogposts. 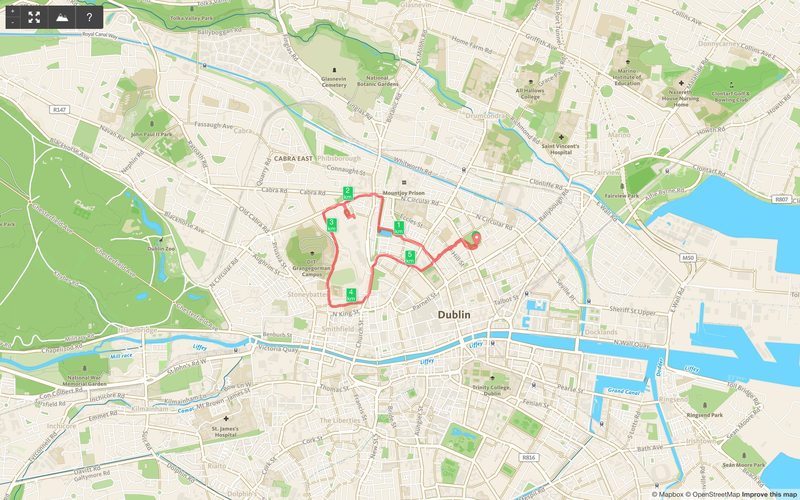 These will form other running routes and shorter races, but all with related Joyce content. 09 June 2014. 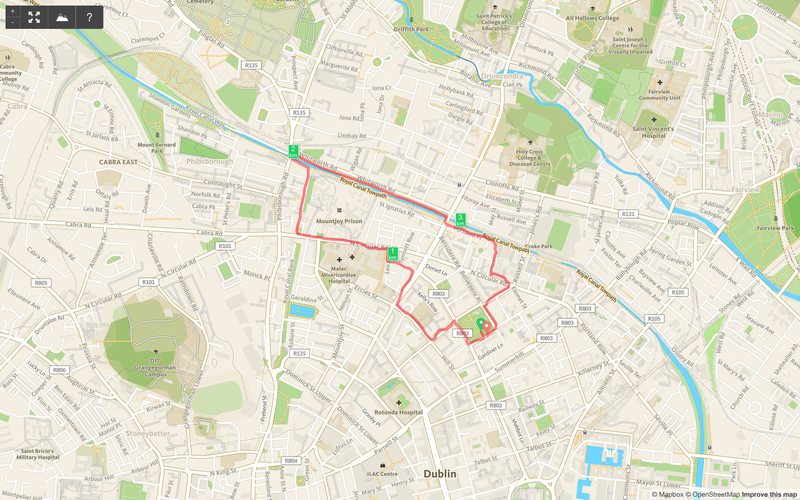 Amendments to JJ.5m end… Better end Fontenoy Street included. 02 June 2014. Test of final route to Sandymount Strand across the footbridge at Booterstown Dart Station. 07 May 2014. End route variations. 27 April 2014. Southern end across footbridge at Martello Tower at Booterstown and back along strand. 06 April 2014. Southern run. Through Merrion Gates, open. 23 March 2014. Newbridge Avenue, Leahy’s Terrace. 17 March 2014. Almost complete southern leg of JJ.5M End at Google Docks. Get OSi and Google on board. Map pre 1904 properties Google Glass soundtrack…. history.. Joyce Bio….Architectural background Map boots to 1904 Sketch Up model. 11 March 2014. Blessington Basin. 04 March 2014. Fitzgibbon Street. 27 February 2014. Northwest of Mountjoy Square. 19 February 2014. 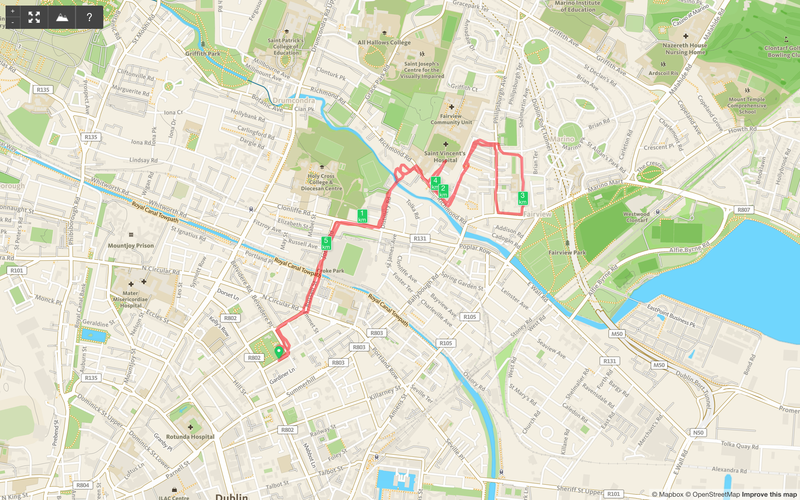 JJ.5M nice route….possibly cut Hardwicke Street. 17 February 2014. JJ .5M North Inner Loop. NCR to Glasnevin Final Route. 12 February 2014. Royal Canal Bank. 09 February 2014. 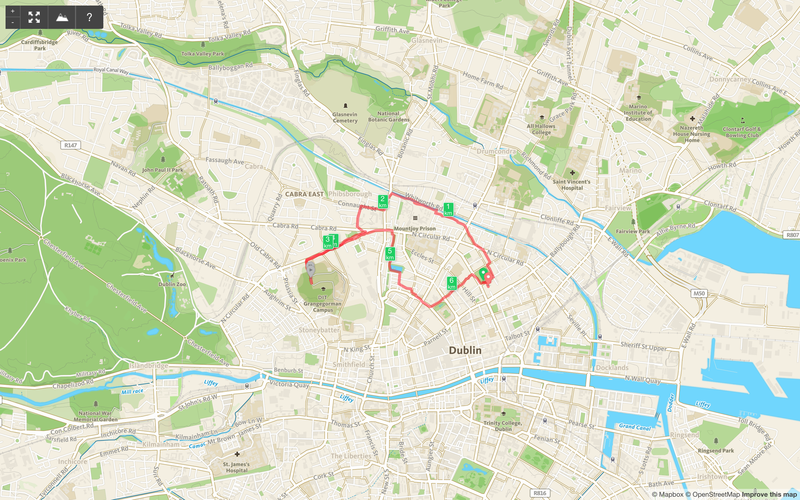 Southern section on James Joyce half marathon. Hug coastline. Avoid Carysfort. Use Gilford Road pass Tram station. Use Google Glass. Involve Google. Crush shells on Sandymount Strand. Pick up Potato and Lemon Soap Lansdowne Road underpass? 05 February 2014. 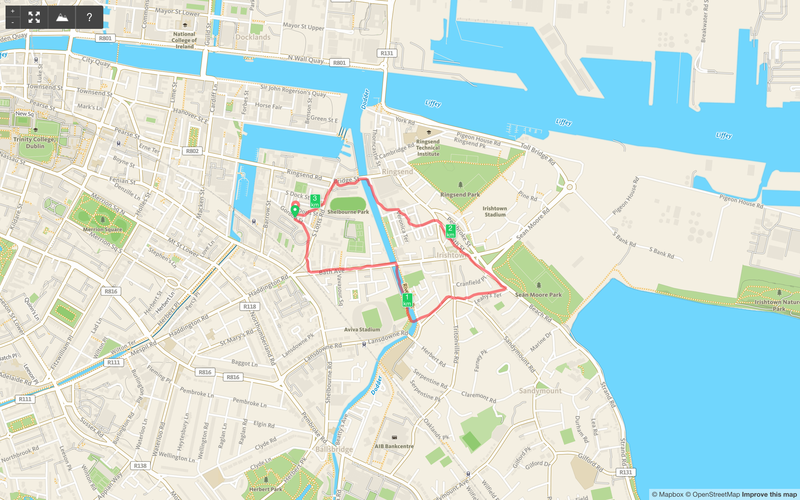 Fontenoy Street Loop. 31 January 2014. Northside route. 17 January 2014. Northside route. 14 January 2014. Belvedere Place, Whitworth Road, Jones Road. 20 December 2013. Route North, Canal Options, Belvedere Place. 11 December 2013. Route North of Mountjoy Square. 05 December 2013. Northside Houses, Jones Road. 24 November 2013. 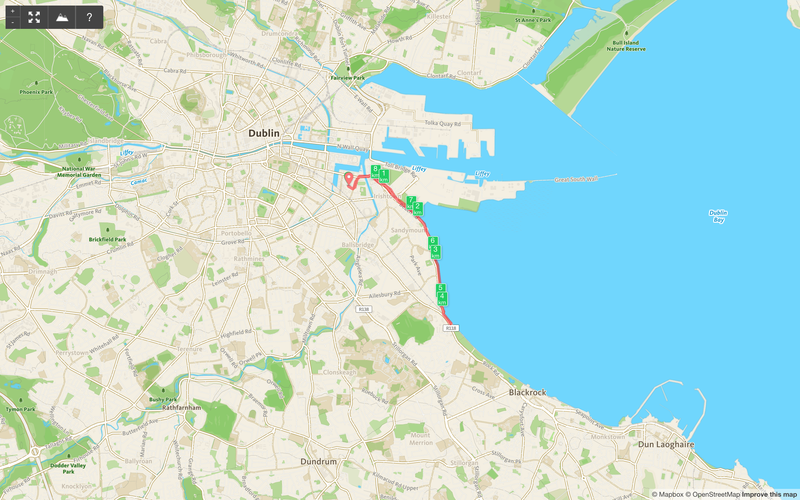 Sandymount Run: Southern Loop. 20 November 2013. Belvedere College, Saint Peter’s Terrace. 18 November 2013. Fairview Loop. 11 November 2013. Test 21k Run: Glasnevin Finish. 25 October 2013. Jones Road. 23 October 2013. Eccles Street. 20 October 2013. Sandymount Strand. 04 October 2013. Clonliffe College. 26 September 2013. Clonliffe College. 24 September 2013. 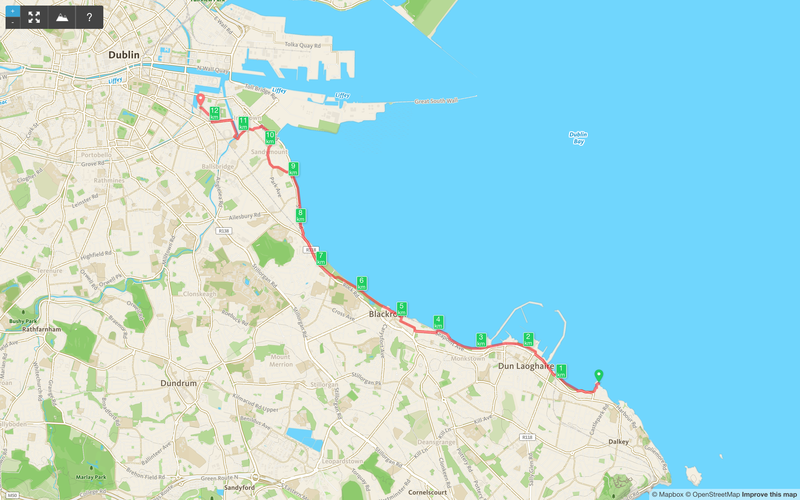 Run to Star of the Sea Sandymount. Steps are at back of The Star of the Sea. And trees… But land to the rear has been reclaimed from the sea. 13 September 2013. Convent Avenue Fairview. 10 September 2013. Joyce Fairview Houses. Note lane connecting Royal Terrace and Richmond Avenue. 05 September 2013. North Richmond Street. 03 September 2013. Hardwicke Street.